The other day I got the urge to play a 10mm scale tabletop miniatures game. 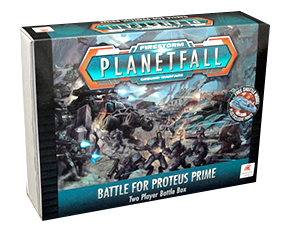 My old copy of Epic 40,000 is in storage, and I wasn’t impressed by the figures (and the prices) of Dropzone Commander, so eventually I decided on Battle for Proteus Prime, the starter set for Firestorm: Planetfall by Spartan Games. And when you open the box, you’ll find it chock-full of gorgeous figures: a couple of Aquan Prime and Directorate armies. They’re all solid resin (with a few metal infantry thrown in), and they’re beautifully detailed and look fantastic when painted. It’s also great to see such detailed stands of infantry, each a group of soldiers huddling, standing or sprawled out on modelled bases complete with cover. The enthusiasm wanes somewhat, however, when confronted with the rulebook. Unfortunately Spartan Games—this is the first of their games I’ve purchased—have a bit of a poor reputation when it comes to rules, and now I know why. The rules bear all the hallmarks of being rushed, with such unforgiveable errors as inconsistent terminology and needlessly complex writing. Still, that’s what the EOG is for! After considerable effort and head scratching I’ve created this rules summary, which fixes problems like calling the same points three different things (what?!). Now that I understand the rules and have played a couple of games of Planetfall, I’m happy to report it lives up to the promise of those gorgeous figures, and I’ll be expanding the armies in the starter set soon. Breaking news: Spartan Games has just shut down! Hope you managed to expand your forces… or if you now want to add on extra units, now’s your change as everything will soon be on clearance. Oddly enough, saw the two player starter of Firestorm only this week and pondered purchasing, but didn’t. I never did expand the forces, and I’m glad I didn’t – though maybe I’ll pick up a few things if the discounts are big enough, because once I sorted out the messy rules it was a pretty good game. It’s obvious from even my cursory contact with their products that Spartan had customer service issues for a long time, and their complete lack of interest in updating the Firestorm Planetfall rules is just one instance of that. I guess they were pinning their hopes on the Halo licence, which was a bad move. Their going out of business blurb made me shake my head: throughout the years that Spartan Games has traded, it has prided itself on the highest level of product quality and customer satisfaction. This has been delivered consistently and is evidenced though annual customer research that the company has undertaken. I guess that tells you how in touch they were with the real concerns of their customers, and why the company folded. But then again, they have to say things like that now in order to try to sell off their IP and assets. Sad news as it was your battle report that made me consider (for quite a while now) to dip my toes into Firestorm Planetfall. The only reason I didn’t was because I couldn’t get anyone else in my gaming group interested. Now it looks like I’ll never play it and Dropzone Commander will now be the de facto standard for games of this type and scale. Well, until GW re-releases Epic 40K, anyway!